An increase in average life expectancy has given rise to a number of pressing health challenges for the 21st century. Age-related memory loss, whether due to a neurodegenerative condition such as Alzheimer’s disease, or as a product of the normal process of aging, is perhaps the most significant of the health problems of old age presently confronting our society. The Preservation of Memory explores non-invasive, empirically sound strategies that can be implemented to ensure long-lasting and effective retention of information. The chapters in this volume describe and evaluate both well-established and novel methods for improving and strengthening memory, for people with and without dementia. They also look at ways in which effective detection and care can be implemented, and describe empirical findings that can be translated into everyday practice. The contributors take a multidisciplinary approach, motivated by the desire to look beyond and across boundaries to find new areas of knowledge and new opportunities. 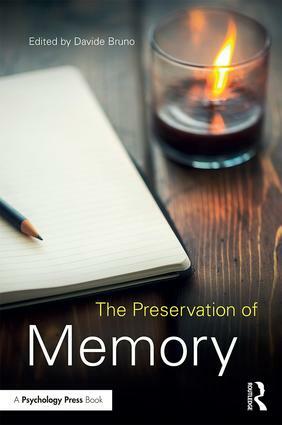 The Preservation of Memory will be useful reading for students and researchers focusing upon memory, aging and dementia, and also for mental health practitioners, social workers, and carers of persons living with dementia or other memory impairments. Davide Bruno is Senior Lecturer in Psychology at Liverpool Hope University, UK.